Social media is still in its infancy and many social media managers, whose backgrounds may be in something slightly different such as public relations, sales or marketing, are still struggling with best social media practices. One of the most overlooked marketing tools starting to get some play in the world of social media experts is that of Personas. A persona is a fictitious representative of a certain portion of your target demographic. Personas have long been used in marketing to help a team connect better with their demo. 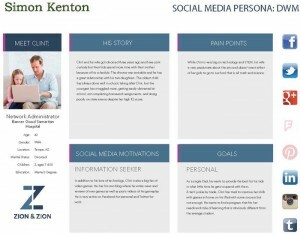 Personas will include photos, names and information about this fictional person’s likes, dislikes, goals, hobbies etc. It is important to think of your customers as people to better attract and relate to them, and personas can help you accomplish this. Personas were originally developed in 1993-4 by Angus Jenkinson and internationally adopted by OgilvyOne. Since that time, personas have become a tool often used in marketing, and a few years back they were adapted for user-centered design websites. If you have attended any social media conferences in 2014, you most likely listened to at least one talk where personas were mentioned, if not the center of conversation, as they are starting to gain more and more traction in the world of social media. What elements does a social media persona include? After reading a complete persona, you should feel very close to your new imaginary friend. It will share details with you about their lives, hobbies, family, and what forces drive them. Ideally, you need to create multiple personas that speak to the cross section of your demo. Keep in mind that moderation is important. You need your personas to be manageable. We recommend making no more than six personas for any given project, however there are certain situations in which six personas simply is not enough to include everything you need to. That is a lot of detail to come up with, right? Answering the (seemingly) simple question of “why are personas important?” Creating six flushed out people in a believable way based on data, survey results and more can take some time and energy but it helps you truly understand how your customers/fans interact with your brand online and off. Understanding that behavior can help you increase fans, increase engagement, decrease time to conversion, and even increase conversion rates. I first heard about social media personas at Social Media Strategies Summit in San Francisco back in 2013 during a presentation from two gentlemen from DDB Worldwide Communications Group Inc. Vince Higgins (Executive Director, User Experience) and Tyler Wilson (Senior Planner) discussed how creating personas for marketing and user-experience was a lot like creating a character for Dungeons and Dragons. For those unfamiliar with Dungeons & Dragons (or D&D), it is a fantasy tabletop role-playing game (RPG) that gained a large popularity in the 1970s and 1980s. Players would have to create a character to play the game, choosing things like your characters’ strengths and weaknesses, skills, race, origins, etc. A marketing persona is a lot like a character sheet from the game. Once everyone has their characters, the dungeon master walks them through the story of their game, tweaking the story based on player decisions, similar to what a social media manager/user experience designer can do as they are creating content or architecture. These completed profiles help you navigate your brand’s online presence the way that your users/customers would, showing you what type of content appeals to them, what they are likely to engage with and what turns them off. Let’s walk through the steps of creating your own social media personas. You need to determine who your target is and then focus on looking at the basics of each profile. Once you have that figured out, you can start expanding each persona’s story and looking at the things that make them real like pain points, goals, motivations and backstories. Personas are about connecting with your audience and seeing how they connect with your brand. So you need to determine who your audience is. You may have some help from your marketing department giving you demo information and targets, or you may need to do some research on your own to determine the appropriate details. To illustrate this process, we are going to use an example based on an actual client. Our example will be a new charter elementary school whose unique selling proposition is its commitment to technology in the classroom and individualized learning plans for each student. For the purpose of this article, we will name this school Simon Kenton in honor of my own elementary school. Simon Kenton already has one very successful school about 25 miles away from the site of its new campus. When looking to increase enrollment, you need students. At an elementary level, the decision makers are 100% parents or primary care-givers so that is the group that we need to appeal to with our social media efforts. Given that it is an elementary school, we will be looking at parents who have kids that are in elementary school, as well as those who had kids who may be slightly younger who are nearing the kindergarten age. Based on the average age that women have their first child (age 25) and the age of a child entering kindergarten (age 5), those parents likely fall into the age range of 25-40. Based on the enrollment at their other campus, the school believes that the majority of their students will come from a 10 miles radius. Simon Kenton excels at helping struggling kids find a love for learning with their unique approach, so we want to target parents who are looking for new solutions for their children who may be struggling in the public school system. Lastly, the social media pages that we are managing will speak for both campuses so we need to keep parents of current students in mind as well. This outline gives us a good mix of ages, background, location and goals. Now we start creating a rich backstory that will help these personas come to life. A persona will only truly come to life for you when you feel like you truly know them. So each persona should have its own history, backstory, and characteristics that make them unique. For the remainder of this article, I will focus on just one persona to provide you with a more simplified example, but keep in mind that most projects require anywhere from 3-6 personas. We are going to work with the Divorced dad. You may find it easier to first come up with a story and then give that persona a name, but personally, I have always found it helpful to choose the name first. This helps me start visualizing the image and personality of the persona better. For our divorced dad, I have chosen Clint as his name. The name doesn’t really mean anything in the long run, but it is a necessary step that helps you personalize the personas, so pick whatever you want, but be sure to choose something that fits with the persona you are developing—it needs to be believable. Your next step will be to choose a photo so that you can put a face to your persona. Believe me it is easier to connect to your persona once you give them a name and a face. You can use stock photos that the client owns, purchase photos, or find free images online. For Clint, we need a white father type. We picked this photo as it showed a great father-daughter moment with technology, which is a key part of the Simon Kenton experience. When did he get divorced? Does he get along with his ex? What kind of education does he have? Clint and his wife got divorced three years ago and have joint custody but their kids spend more time with their mother because of his schedule. The divorce was amicable and he has a great relationship with his two daughters. The oldest child has always done well in school, taking after Clint, but the youngest has struggled more, getting easily distracted at school, not completing homework assignments, and doing poorly on state exams despite her high IQ score. This gives us a good picture of Clint and what his point of view is about his daughters’ education and life. Now that you have an idea of who Clint is, we can talk about what his goals are, keeping in mind how they relate to your client. We talked about how Clint’s youngest daughter has struggled in school despite her intelligence. As a loving parent, we can assume that Clint wants his daughter to succeed and learn. With his own background in technology and level of education, it seems likely that he would try to help on his own by using technology, but he understands that he can only do so much from home, especially when the classroom environment she is currently in isn’t working for her. With those thoughts in mind, we came up with this goal. As a single Dad, he wants to provide the best for his kids in what little time he gets to spend with them. A tech junkie by trade, Clint has tried to improve her skills with games at home on his iPad with some success but not enough. He wants to find a program that fits her needs and style of learning that is obviously different from the average student. No human is two-dimensional, and a good persona shouldn’t be either. We all have goals but what keeps us from achieving those goals? What slows down our progress? This is another element to keep in mind when you develop and define your persona’s pain points. Using Clint as an example, he is not the sole decision maker for his daughter’s education, so he needs weigh in from his ex-wife who has her own goals for the girls as well. This convergence can be his pain point. While Clint is very big on technology and STEM, his wife is very passionate about the arts and doesn’t want either of her girls to go to a school that is all math and science. Since we are specifically looking at social media profiles and how our brand will interact with them online, it is important to understand what motivates your persona online. What are they looking for from a brand they follow? What is going to drive them to engage with you online? What about offline? There are five categories of fans/followers we will take a look at. Fans/Brand Advocates – This group of people really likes your company or your product and are willing to state so publically. While they are fans, this doesn’t necessarily mean that they are your best customers. Information Seekers – Many people turn to the Internet for research, whether it is on a new health topic, the latest fashion or reviews of a product. They are always on the lookout for information that can help them with decisions. Discount Chasers – There have always been people who are looking for a deal, but since the economic downturn, more and more people are becoming bargain shoppers and social media is a great place for them to find deals. Usually this is the only reason that they follow you and will only pay attention to that type of content. If you stop posting about deals and special offers, they will stop paying attention. Social Media Influencers – When thought leaders/trend setters on social media talk about a product, person or concept, it can spread like wildfire. These people often have influential blogs and many fans/followers. One tweet from @aplusk (a.k.a. Ashton Kutcher) can launch a company into high-gear as it drives traffic and engagement. Negative Nellies – These are the kinds of fans that we often wish would go away. I use the term “fans” loosely as these people don’t like your company and they want the world to know it! They will use social media to share a negative experience or perceived slight and if not handled properly, can also drive traffic to your profiles – in a bad way. So what category would you think that Clint would fall under based on what we have listed so far? Well if you guessed Information Seeker, then you picked the same as we did, but really it could be any answer. As you build your personas, it is good to include a mix of these categories to have a broad spectrum. Additionally, think about what social media platforms this person is active on. Even if you are only doing one platform for a client, it is helpful to think about your persona’s entire web presence and understand how their motivations play out on all of them. With all of this detail, you have a good social media persona created. Here is what our finished profile of Clint looks like. This is indeed an example of a persona that would be one of a set of personas that we at Zion & Zion might develop for one of our clients that had engaged us as their social media agency. Repeat the entire process to create as many personas as you need and you will have a great place to start working when it comes to working on social media content and strategy. Having personas of your customers can come in handy for so many different reasons. Thinking about running a contest on your social media page? Look at your personas. Would they participate? How are they most likely to participate? Will they only like something or share it? Or will they be more willing to post a photo and use a hashtag your brand created? Need to develop content that is going to drive more engagement? Look at your personas. What are they passionate about? What are they interested in learning more about? These personas will become your friends and teach you a lot about your brand, making it easier to get the content that your audience wants to see and hear. As you progress, you can compare your personas to your analytics. Are they matching up? Is there a segment of you audience that you didn’t originally profile but now seems to be prevalent? Create another one! Expand on an existing one! Personas are fluid and can change just as people change. Building social media personas is like creating characters in a game or story. You need to flush your personas with out with details that might not seem relevant to make them come alive to you and your team. You will name them, give them a face, a backstory, goals and even pain points. And since social media is our medium, look at their motivations for participating on various social media platforms. Good personas will guide your social media strategy toward greater engagement. Not to mention it will help you create more brand advocates. Now it’s your turn, so get creating!